I think Mr. Ozturk must be the only man who actually would prefer to be on the receiving end of a single long stemmed rose. 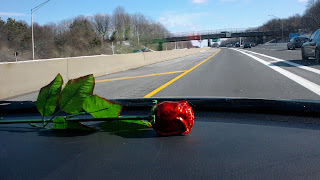 For the sake of doing something for Valentines, I got him a long stemmed, chocolate rose from Dylan's Candy Bar. He promptly drove us over afterwards to Buttercup Cafe and I got myself a pink cupcake on him. It's not like we actually exchanged gifts and gave in to the system.